"Littoral" redirects here. For other uses, see Littoral (disambiguation). For the transfer of business or IT processes into a nearby country, see Nearshoring. The littoral zone of an ocean is the area close to the shore and extending out to the edge of the continental shelf. The intertidal zone of a beach is also part of the littoral zone. Estuaries are also in the littoral zone. 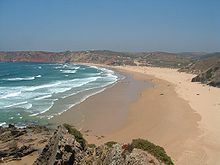 Look up littoral in Wiktionary, the free dictionary. Look up circumlittoral, infralittoral, sublittoral, or supralittoral in Wiktionary, the free dictionary. In oceanography and marine biology, the idea of the littoral zone is extended roughly to the edge of the continental shelf. Starting from the shoreline, the littoral zone begins at the spray region just above the high tide mark. From here, it moves to the intertidal region between the high and low water marks, and then out as far as the edge of the continental shelf. These three subregions are called, in order, the supralittoral zone, the eulittoral zone and the sublittoral zone. 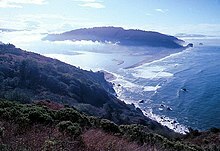 The supralittoral zone (also called the splash, spray or supratidal zone) is the area above the spring high tide line that is regularly splashed, but not submerged by ocean water. Seawater penetrates these elevated areas only during storms with high tides. Organisms here must cope also with exposure to fresh water from rain, cold, heat and predation by land animals and seabirds. At the top of this area, patches of dark lichens can appear as crusts on rocks. Some types of periwinkles, Neritidae and detritus feeding Isopoda commonly inhabit the lower supralittoral. The eulittoral zone (also called the midlittoral or mediolittoral zone) is the intertidal zone also known as the foreshore. It extends from the spring high tide line, which is rarely inundated, to the spring low tide line, which is rarely not inundated. The wave action and turbulence of recurring tides shapes and reforms cliffs, gaps, and caves, offering a huge range of habitats for sedentary organisms. Protected rocky shorelines usually show a narrow almost homogenous eulittoral strip, often marked by the presence of barnacles. Exposed sites show a wider extension and are often divided into further zones. For more on this, see intertidal ecology. The sublittoral zone starts immediately below the eulittoral zone. This zone is permanently covered with seawater and is approximately equivalent to the neritic zone. In physical oceanography, the sublittoral zone refers to coastal regions with significant tidal flows and energy dissipation, including non-linear flows, internal waves, river outflows and oceanic fronts. In practice, this typically extends to the edge of the continental shelf, with depths around 200 meters. In marine biology, the sublittoral refers to the areas where sunlight reaches the ocean floor, that is, where the water is never so deep as to take it out of the photic zone. This results in high primary production and makes the sublittoral zone the location of the majority of sea life. As in physical oceanography, this zone typically extends to the edge of the continental shelf. The benthic zone in the sublittoral is much more stable than in the intertidal zone; temperature, water pressure, and the amount of sunlight remain fairly constant. Sublittoral corals do not have to deal with as much change as intertidal corals. Corals can live in both zones, but they are more common in the sublittoral zone. The infralittoral zone is the algal dominated zone to maybe five metres below the low water mark. The circalittoral zone is the region beyond the infralittoral, that is, below the algal zone and dominated by sessile animals such as oysters. Shallower regions of the sublittoral zone, extending not far from the shore, are sometimes referred to as the subtidal zone. In freshwater situations, littoral zones occur on the edge of large lakes and rivers, often with extensive areas of wetland. Hence, they are sometimes referred to as fringing wetlands. Here, the effects of tides are minimal, so other definitions of "littoral" are used. For example, the Minnesota Department of Natural Resources defines littoral as that portion of the lake that is less than 15 feet in depth. The littoral zone may form a narrow or broad fringing wetland, with extensive areas of aquatic plants sorted by their tolerance to different water depths. Typically, four zones are recognized, from higher to lower on the shore: wooded wetland, wet meadow, marsh and aquatic vegetation. The relative areas of these four types depends not only on the profile of the shoreline, but upon past water levels. The area of wet meadow is particularly dependent upon past water levels; in general, the area of wet meadows along lakes and rivers increases with natural water level fluctuations. Many of the animals in lakes and rivers are dependent upon the wetlands of littoral zones, since the rooted plants provide habitat and food. Hence, a large and productive littoral zone is considered an important characteristic of a healthy lake or river. Littoral zones are at particular risk for two reasons. First, human settlement is often attracted to shorelines, and settlement often disrupts breeding habitats for littoral zone species. For example, many turtles are killed on roads when they leave the water to lay their eggs in upland sites. Fish can be negatively affected by docks and retaining walls which remove breeding habitat in shallow water. Some shoreline communities even deliberately try to remove wetlands since they may interfere with activities like swimming. Overall, the presence of human settlement has a demonstrated negative impact upon adjoining wetlands. An equally serious problem is the tendency to stabilize lake or river levels with dams. Dams removed the spring flood which carries nutrients into littoral zones, and reduces the natural fluctuation of water levels upon which many wetland plants and animals depend. Hence, over time, dams can reduce the area of wetland from a broad littoral zone to a narrow band of vegetation. Marshes and wet meadows are at particular risk. For the purposes of naval operations, the United States Navy divides the littoral zone in the ways shown on the diagram at the top of this article. The United States Army Corps of Engineers and Environmental Protection Agency have their own definitions, and these have legal implications. ^ "Fisheries lake surveys". Retrieved 2006-03-17. ^ a b Keddy, P.A. 2010. Wetland Ecology: Principles and Conservation (2nd edition). Cambridge University Press, Cambridge, UK. ^ Houlahan, J. E.; Keddy, P. A.; Makkay, K.; Findlay, C. S. (2006). "The effects of adjacent land use on wetland species richness and community composition". Wetlands. 26 (1): 79–96. doi:10.1672/0277-5212(2006)26[79:TEOALU]2.0.CO;2. ^ Keddy, P.A. 2010. Wetland Ecology: Principles and Conservation (2nd edition). Cambridge University Press, Cambridge, UK. 497. Chapter 2.